On July 26, 2018, a Health Care Town Hall at the Frazier Park Library brought 14 panelists and a full house of mountain residents together to focus on updates to health services to this rural region. Previously, in Parts One, Two, Three and Four, we met Chief Brian Marshall of Kern County Fire Department; Myron Smith of Hall Ambulance Service; Brian Harris, CEO of Clinica Sierra Vista (CSV); Brent Burket, M.D., of CSV in Lebec; Sharon Powell, Pine Mountain Health Center; Sarah Edwards, Ph.D., Psychotherapist; Anne Weber Burnaugh of the Family Resource Center; Militsa Brennan of South West Health Care District and the Mountain Communities Health Fair; Pharmacist Ty Stout, of the El Tejon Pharmacy in Frazier Park; plus Chief Steve Shoemaker and Captain Steve Freeland of the Kern County Fire Department, and Hall Ambulance managers Darrell Stapley, Ryan Strange and Mark Corum. In Part Five, Brian Harris, the CEO of Clinica Sierra Vista (CSV—with about 90 facilities in the Central Valley) told of changes to the CSV network, including the clinic in Lebec. He has contracted with RadNet for expanded imaging services, but an X-ray tech is also back at Lebec. Some lab tests will also be done on-site in Lebec. Sharon Powell of Pine Mountain Health Center said PMHC is providing extra services, including house calls. Dr. Brent Burket of CSV said they will be able to do much more on-site than before at the Lebec clinic, and that it is an exciting time. In Part Six, Health care providers speak about more changes. Chief Marshall, do you want to address changes that you see happening? Changes in the fire department? Not a lot of changes, but there are some things that we’re doing now. One thing, I believe Kern County is very progressive in emergency medical care. 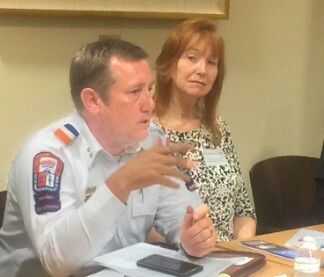 Hall Ambulance Service’s Myron Hall explained the new electronic records systems they are adopting, as Anne Weber Burnaugh of the Family Resource Center and Kern County Fire Chief Brian Marshall listen. We are grateful to all the panelists for participating. B.J. Saidi, president of the Mountain Communities Chamber of Commerce, recorded the event. 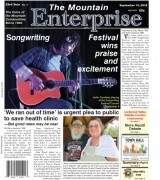 The Mountain Enterprise is producing the transcripts. Susan Templeton of the Frazier Park Library hosted. The Health Care Town Hall hosted at the Frazier Park Library heard about changes ahead in health services here.